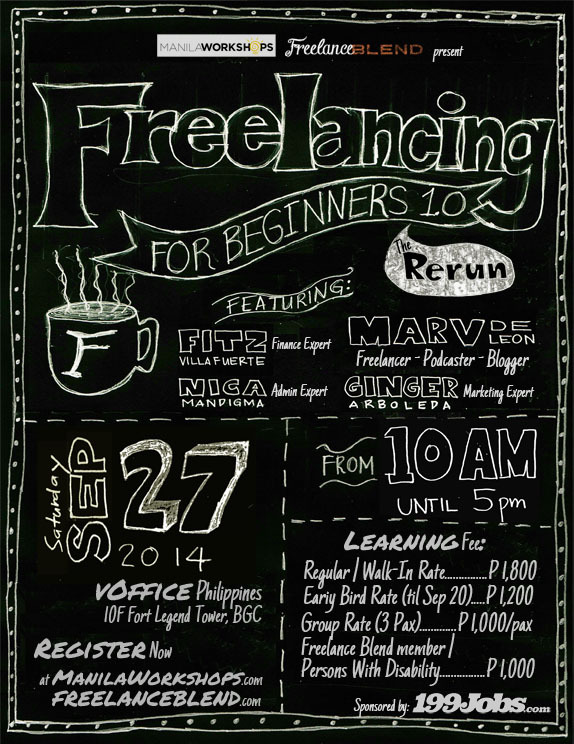 We are happy to bring back the highly successful Freelancing for Beginners 1.0 Workshop on September 27, 2014 (Saturday) from 10am to 5pm at vOffice in BGC due to the tremendous response we received from the first run last August 16, 2014. (Here are photos from the previous workshop). In fact, we had to close the registration two days before the event because the registrations have far exceeded the seating capacity of the venue. To those who missed the first run, this is another great opportunity for you to learn the basics of freelancing from the leading influencers in the freedom business landscape. (You may register now by clicking the button below). 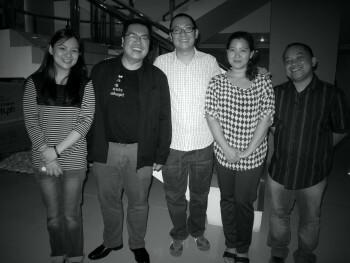 Yours truly, Marv de Leon, will again be the main speaker for the event. Back as panelists to answer all your freelance career questions are the Freelancer Experts: Fitz Villafuerte, RFP – Personal Finance Guru and author of the new book, The Ready To Be Rich Guide to Investing, Ginger Arboleda – Marketing Expert, pro-blogger and serial entrepreneur, and Nica Mandigma – Virtual Administration Expert, co-organizer of Freelance Blend and blogger. During the workshop, we will teach you how to craft your very own winning Freelancer Selfie and then have the rare opportunity to be critiqued by our Freelancer Experts — it’s like being a contestant in “The Voice”! What’s more, the winner of the Best Freelancer Selfie will win a special prize from Freelance Blend and Manila Workshops. Meanwhile, here are a few samples of Freelancer Selfies from our past learners. Are you ready for the challenge? Are you ready to “Choose Yourself” and launch your very own freelance business? Hurry, slots are limited and we will close the registration again once it fills up. Furthermore, the learning fee will increase on September 20, 2014. Click the button below to register now (please note that you are not considered registered until you settle the learning fee). P.S. Here are a few more details about the workshop. Freelancing for Beginners 1.0 The Rerun is a one-of-a-kind workshop that will help you discover your freelancer personality, learn practical tips on how to earn from home and empower you to turn freelancing into a part-time career or into a full-time freedom business. Are You Fit To Freelance? Craft a winning Digital Portfolio that will attract paying clients. Pick the brains and be inspired by our Freelancer Experts in the areas of personal finance, marketing, administration and entrepreneurship. 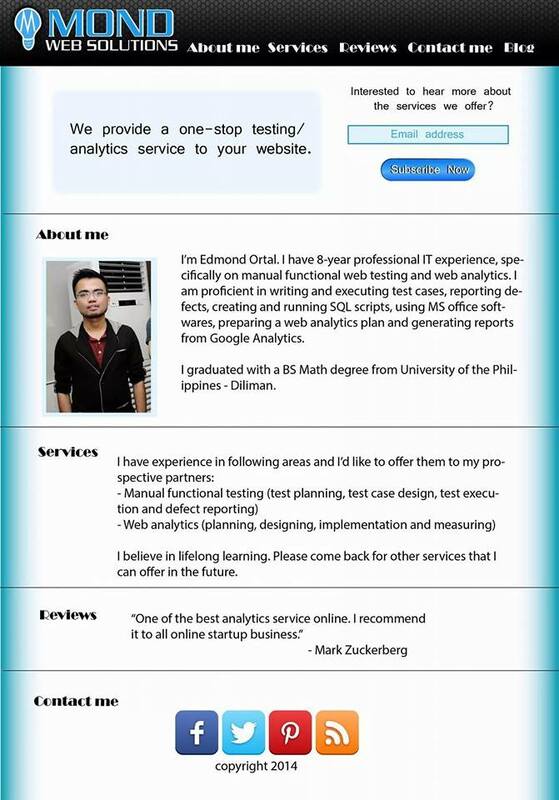 Get constructive criticism from our Freelancer Experts on your freelance business plans and on your Digital Portfolio. Take The 7 Action Steps that will lead you towards your freedom business. Network and become part of an exclusive and private freelancer support group: The Freelance Blend MasterMind Group. The workshop was a great source of information on the whole concept of freelancing. Not only did it address a lot of questions for interested ones like me but also provided a list of reminders to manage one’s expectations. I appreciate how organized it was and how generous in sharing knowledge the people involved are. He is planning to retire early to focus on family, graphic design, business, and helping Filipinos fulfil their dreams through freelancing and freedom business. Hurry, slots are limited and we will be closing the registration upon reaching maximum capacity. Moreover, the learning fee will increase to the Regular Rate on September 20, 2014.